It was beautiful. It was good though I may say Our Times and You Are The Apple Of My Eye are better, nonetheless, the movie keeps me wanting more towards the end. The acting was great, nothing cringy and both actors played their part so well. Just that thinking about it, I cant really see their in love, yes you know they love each other but maybe, I believe its on Eddie Peng's side. The movie was shot pretty well, It was one of the reasons why I came to like the movie though I feel like it was quite lengthy but it kept me wanting for more and the ending left me hanging. It lacks depth in its story telling and emotions, there seems to be lacking in the movie, its like a food with all ingredients but still taste bland. CG Effects are not that great for a movie. Jo In Sung is great but still Nam Joo Hyuk needs to improve his acting skills, he is not that bad here but his expressions needs a lot of training. Seol Hyun, its my first time seen her act and she was good in here. There were some great moments like almost heart-wrenching but fails for it always felt rushed. Over-all its just a movie to watch if you're bored. I just bumped into this and tried since many people are fully waiting for it. I knew it was a manga from reading the comments but I never have a clue what this movie all about and that makes it even special. I simply loved it. It made my heart felt heavy all throughout the movie. it was raw, it was great, it was refreshing and they have captured the essence of friendship pretty well. It would be great if they had a drama version following the flow of the movie, it would be greater then. The movie would make you feel how awesome to have good friends beside you, how great it would be to fully understand other people and the fact that its ok to fully open to others. So sad that its only 2 hours and you can only make much with the given time but definitely one of the best manga adaptations I have watched. Now I fully have a grasp what a parallel universe is. I'm satisfied with the ending but I dont know if I can be fully happy with it. I have mixed emotions really. you will definitely wont regret watching this drama! my top list has been shaken by this drama. you will feel the love, heartaches, depression, happiness, all the smiles, and wanting to have a best friend. i have seen some posters about this drama awhile back but never paid attention to it since it was a taiwanese drama and never had a good impression in any taiwanese drama except for meteor garden and fated to love you plus the fact that i know taiwanese dramas tend to be very lengthy. then i came accross some sites wherein some users recommended this, then i read the synopsis. it didn't end there since i dont want to waste my time starting a drama and dropping it only after finding its not worth ti (i've been doing that a lot lately). i've explored more and read a couple of comments and reviews on this and then bang!, i said OK, im gonna watch this. i downloaded the 1st 3eps to see. i was smiling and having so many feels on this drama. and i downloaded everything in 1 go. i finished this drama in 1day (1 whole night and 1 day). That's how i feel moved and excited for the feelings of the main characters to evolve. Li Da Ren's character has become my ideal - guy and friend. really! the actings of the main character is so real that while watching it, it feels like ts really a true reaction from them, feels like "yes, i would acted that way if it was me", no wonder they have won both the best actor and actress trophy. the drama is so realistic. you will be touched by the whole story - family bonding, great friendship, career love, forgiveness and moving on. on the note: this is a taiwanese drama thus its quite lengthy but sure you wont mind it. after awhile, i find a drama worth to keep. The story could have been better if it was all set in the historical set up I believe. 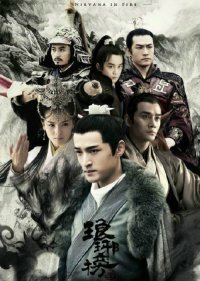 Also, I dont know if its just me but I think the drama isn't a grand scale drama, like most chinese dramas starring a well known star, you can see it has a very limited budget from the set up and the very simple back drops and castings. I dont know why Victoria hops on in this kind of drama but well, good thing is it has made her a hot search actress even made it to top 3 search in Vlinkage. I really cant get the "LOW, SEEMINGLY MONOCHROMATIC TONE" of the drama. Victoria;s very low tone acting, even if she is angry, surprise, sad, happy, its all LOOWWW TONE and her voice is SOO SMALL like I dont know how to describe it. Johnny Huang is the same, his acting is really weird, not really in a bad way but his acting is really of LOW TONE, buahaha I dont know how to put in the rights. His facial expressions, even if he is angry, jealous, surprise, mad, theres very minimal reaction and acting you can see from him. I dont like the way the voice acting and tone of Victoria and Johonny Huangs acting lol. The drama is low budgeted but they lucked out. The story is good but dull at the same time. It lacks life, yes thats it. The story lacks life coming from their main stars. Sigh, next time if there is season 2, cant they have it filmed in China? or maybe they could choose a better location, better costumes, and more settings? Its my first time waiting for a live manga adaptation to come out. After watching a movie about high school love and friendship, I wanted to watch a movie again with the same genre and feels. Thanks to this site, I have found out about this movie. So you know, I am not fond of manga adaptation to movies, I have never really liked any (except some dramas). Upon knowing about this and going through the trailers, I know, its this kind of movie I have been waiting for. I waited, searched, and finally Its here. The story, as we all know, isn't knew, childhood friends who turned to lovers but before that they need to settle their own real feelings and to achieve that they need to break some hearts first.lol But, that's what I love about this movie. Simple, funny, comedic at times and even though you have watched any other movies with the same story, this movie doesn't feel redundant after all. I love the exaggerated expression of the heroine. She was really good in her portrayal in this movie (although I haven't read the manga but I never thought of any slapstick moment in her acting here). For the guys, Yamazaki Kento was good, (I was going to comment on how should he put more effort in his character but Im going to believe that's how Rita should be portrayed based on the manga. For Kentaro Sakaguchi, this is my first introduction to him, but just like Hatori said, &amp;amp;quot;he's freaking handsome&amp;amp;quot;. He is perfect to be Kosuke Hiromitsu, he has really played the role well. His acting and characterization is much better that Yamazaki Kento thus it can't be helped for the audiences to fall for him and have that &amp;amp;quot;second lead syndrome feel&amp;amp;quot;. And yes, I liked him more.The story was perfectly made and I feel satisfied with everything. I just think they could've made some great moments/additional scenes out there but since they were following the manga, then it cant be helped. I was just quite disappointed that they didn't even once played the movie Ost. I jsut love that song and its been on repeat in my playist. I was really waiting for it to be played somewhere in those cute heart stopping moments but, it didn't. It could've made the movie more romantic. Grr, they should really have added it then my rating would be higher. You will feel more their emotions with it. It is a solid movie for its script, combined with top notch acting from Kim Hye Soo, Yoo Ah In and the supporting cast. Nothing spectacular but I find it really interesting how they made the 1997 Asian Financial Crisis into a gripping, compelling movie. Honestly, I only watched this because I of Yoo Ah In, I simply wanna watch him act and showcase his prominent acting (which he did not disappoint), though I did not regret watching this movie, I may not even bat an eye to this if not for him. The movie reminded me why Kim Hye Soo is a top actress, she sure commands the screen when she's on. The drama despite feeling a bit documentary is surprisingly not monotonous. I may not be able to grasp some things, needed to pause here and there to chew what they were talking (not really good at with the subject matter - "FINANCE") but you will find yourself entertained a bit. On the side note, I now only realized after watching this movie that we were also affected with the Asian Financial Crisis back in the same year. Layoffs and shut down of big companies. Well, it shows that this movie has fed me something to remember and ideas I only get to know because I watched this. Well, its not that outstanding but the acting and the pace goes smoothly so its a movie you will be able to finish if you watched it on a pretty good day. As for me, I like the actors playing as leads here especially Yoon Kye Sang. I decided to watch the movie because I mainly wanna see him in an action flick with a badass character. To add to that excitement is his long hair here. Ma Dong Seok is great as always. The story since they based it on a crime that has happened years ago, its quite simple, a story that feels like you've seen and heard a couple of times. If you like the artists, these movie will somehow enjoy you, if not then I don't quite recommend this. 7.5-8/10 for me. I love it. A feel good drama splash with a bit of mystery, hot guys, sweets, colorful cakes and good acting. Joo Ji Hoon is rough and is oozing charisma here. Kim Jae Wook certainly played his character well and Yoo Ah In is well, being Yoo Ah In. The story has holes but I that didn't bother me. I just thought that there was a greater mystery that needs to be solved out there but half way through, it felt like they were just showcasing their cakes, the bakery, customers and the actors. I am a fan of the 3 leads especially of Joo Ji Hoon and Yoo Ah In so I am giving this a high rating because its them and because acting wise, all of them delivered. I never knew I would really liked a movie with this genre. It was a movie I will never forget, I remember I was super shocked by the ending, I almost screamed and bit my tongue. It was the best revenge drama that I have watched, though the rewatch value for me is lower since the thrill slows down once you have watched it already and its a dark movie, though I applaud the writer for coming up with this kind of story-dark but outstanding.